An NDP plan to end the practice of leaving money unspent at Veterans Affairs Canada (VAC) was unanimously approved by the House of Commons Tuesday afternoon, just five days before Remembrance Day and the 100th anniversary of the end of the First World War. The motion states that any money carried forward should be targeted toward VAC meeting its own standards in the 12 service areas where it is currently failing, including improving wait times for disability benefits, telephone services, vocational training and rehabilitation programs. 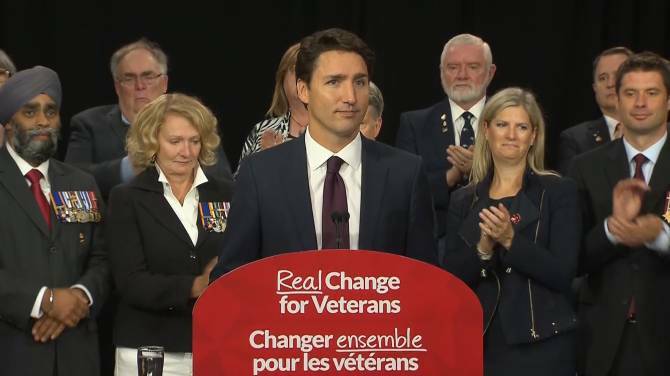 As Global News first reported in September, Prime Minister Justin Trudeau’s Liberal government has allowed more than $372 million meant to help veterans and their families go unspent since taking office in November 2015. This is despite promises from then-Liberal leader Trudeau, who in August 2015 said that leaving money meant for veterans unspent was “wrong,” that a government led by him would fix it. Tuesday, Trudeau made good on that promise. This also follows more than $1.1 billion of unspent funding at VAC during the time Stephen Harper’s Conservatives were in power. According to NDP Leader Jagmeet Singh, this proposal will “end the theft” at VAC and stop veterans from being “robbed” of the resources they so badly need and deserve. While motions passed in the House of Commons are not binding — meaning the government has no legal obligation to stick to the plan — they carry significant meaning. Singh says this plan could mean as much as $124 million a year more for veterans. He also says it’s an important first step in ensuring veterans who’ve sacrificed so much have access to the benefits they need in a timely manner. Since taking office, Trudeau’s Liberals have reopened nine veteran service offices closed by the Harper Conservatives. The government has also rehired roughly 470 front-line staff — including case managers — who work closely with veterans. The NDP says with unspent money at VAC now being carried forward, the number of front-line staff at VAC can increase dramatically, meaning shorter wait times and better outcomes for veterans.